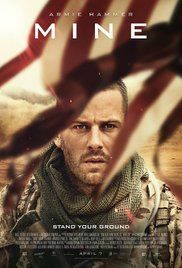 After a failed assassination attempt during a mission in North Africa, US Marine Mike Stevens (Armie Hammer) finds himself trapped on a land mine. If he moves, the mine will explode. Exposed to the desert elements, he must survive the dangers of the desert and battle the psychological and physical toll of the treacherous conditions, remaining motionless for two days waiting for help. Read more on Wikipedia.